• Mr Lolly is a member of the world famous Magic Circle. • Mr Lolly has full Public Liability insurance and is CRB checked. • Mr Lolly presents a free Mr Lolly Magic Wand with every booking. 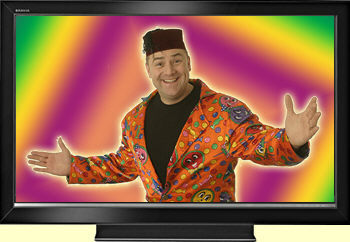 Click on the TV to see Mr Lolly in action! When he's not entertaining at parties Mr Lolly can be found performing stunning close-up magic for adults. As a member of the world famous Magic Circle, Lol James performs at Private Parties, Company Dinners, Weddings, Exhibitions, Product Launches, Restaurants... in fact, just about everywhere! Visit www.loljames.com for more information.